Description: New server power cord. Check the pictures carefully. 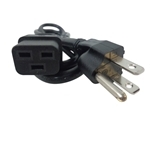 This has a special type of connector that plugs into the power supply. This cord is 6 feet in length. Dell PowerEdge 1855, 1955, 6650. Dell XPS 700, 710, 720. 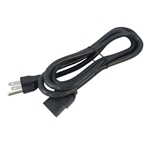 *Some of the models listed can use a regular cord rather than this cord. Please look carefully to make sure this is the cord that you need. Compatible Power Supply Part #'s: ND285, N1000P-00, NPS-1000AB A, PM480, NPS-1000AB-1, H1000E-00, JW124, 86GNR, 7000245-0000, AHF-2DC-2100W, G5029, HY334, MJ046.